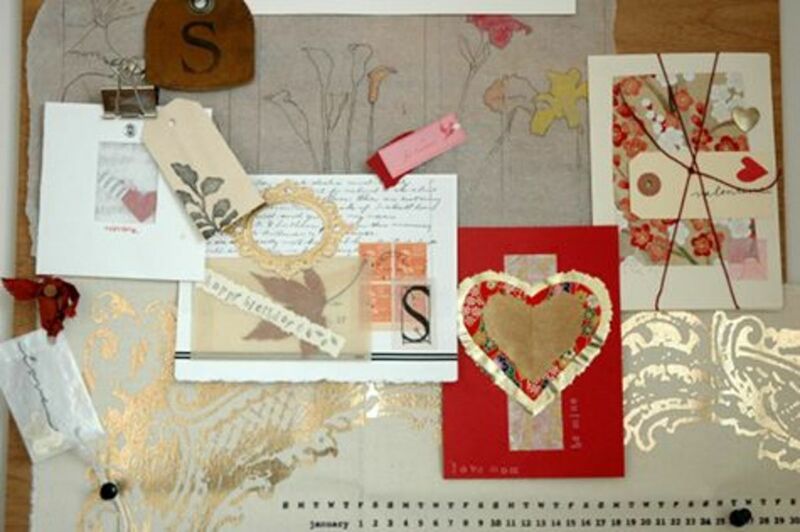 Design your craft room layout with the inspiration of others. Depending on your budget you can create a functional craft room that helps you get the job done or you can go all out with a shabby, chic craft room that would inspire others. The idea of a perfect craft room varies by the artist and type of craft. A small hair bow crafter may require a small space while a multi-craft artist will require a much larger space. 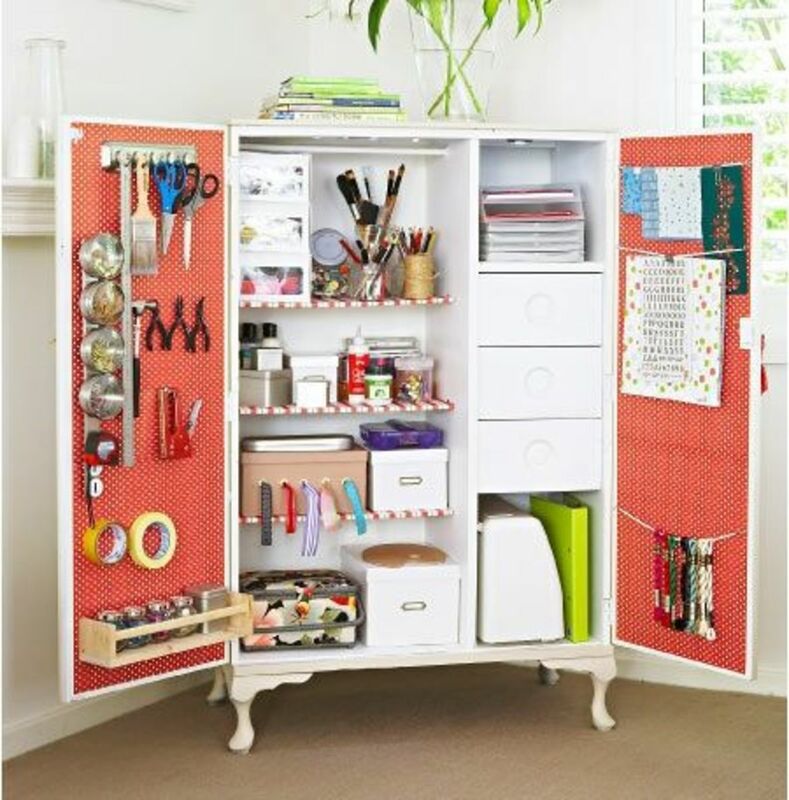 You can turn any room, even a closet into a craft studio with the right craft room organization. 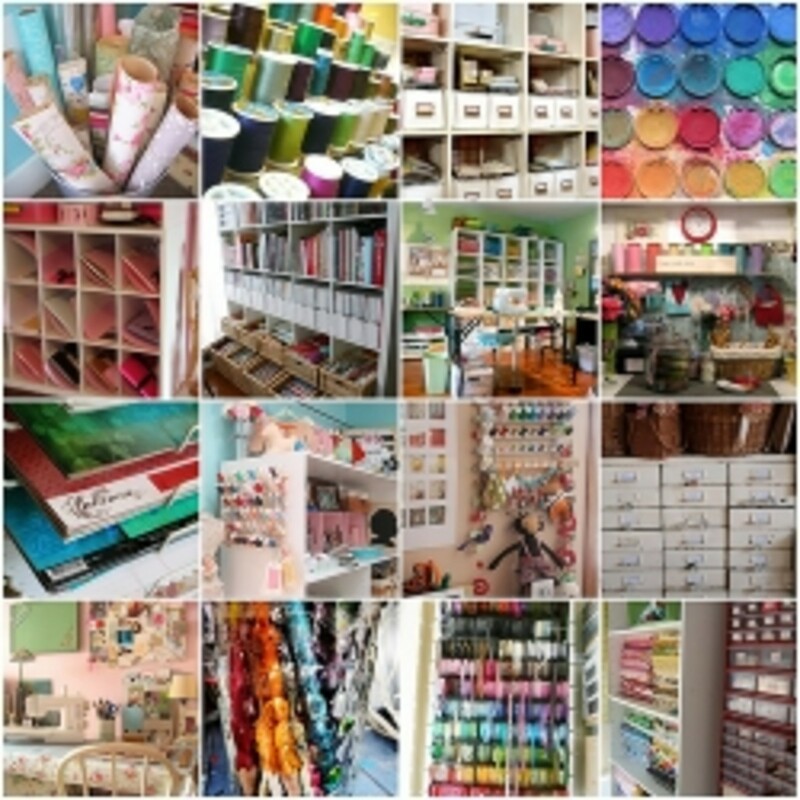 Here you will find pictures, ideas and much more for creating, designing and organizing a craft room. 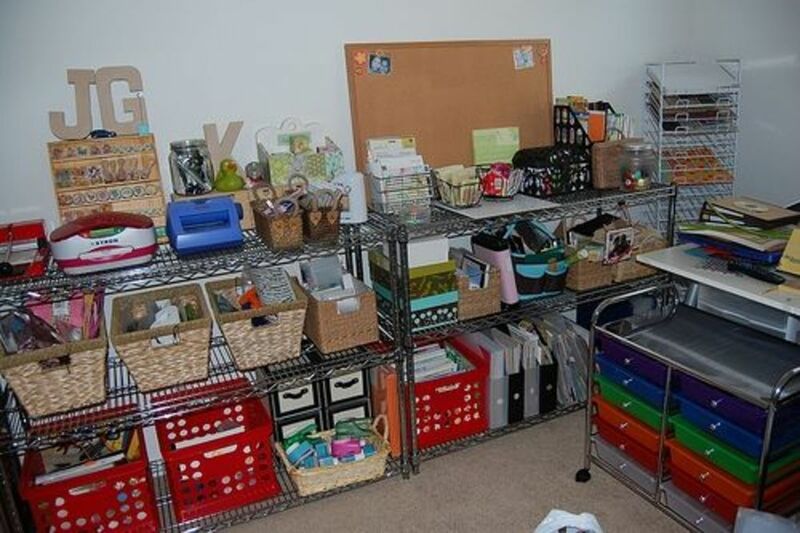 Use Various Types of Organizers to Tidy Up Your Craft Room - One Box Does Not Fit All! Since craft supplies come in thousands of shapes, sizes, colors and textures, it is expected that you would need various types of craft organizers. Consider using plastic show boxes for larger items, photos, cards and die cuts. 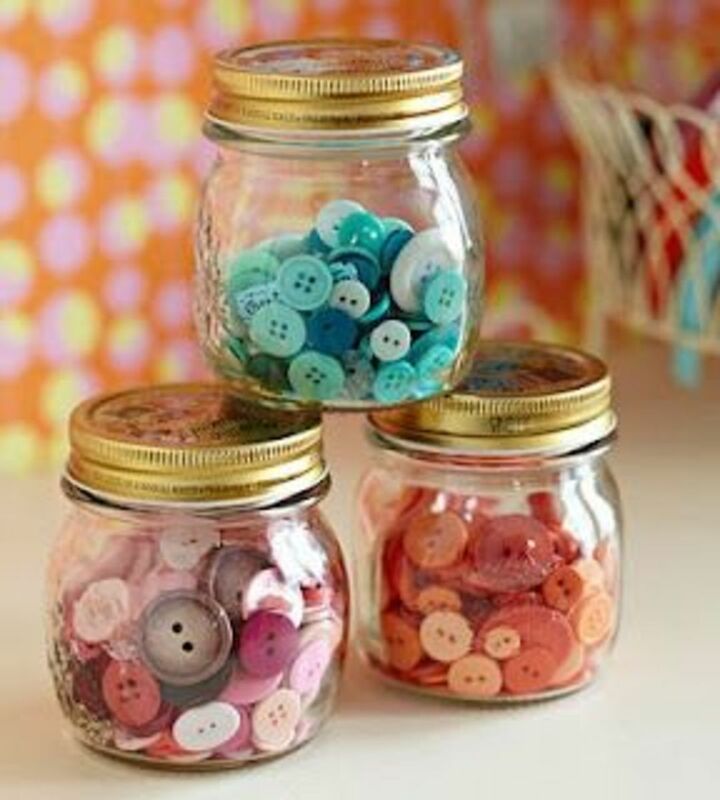 Use jars and canisters for small items such as beads, buttons, pins and embellishments. 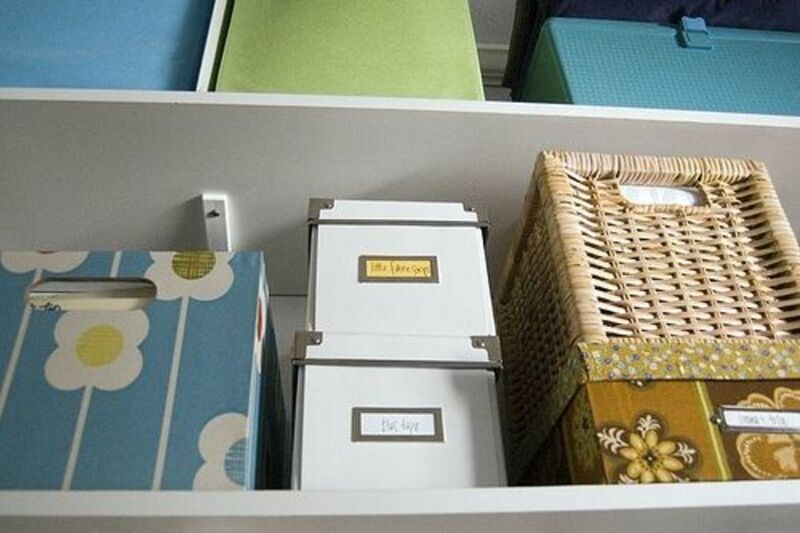 Use Organizers with dividers for those same items if you want them sorted by colors, size or styles. 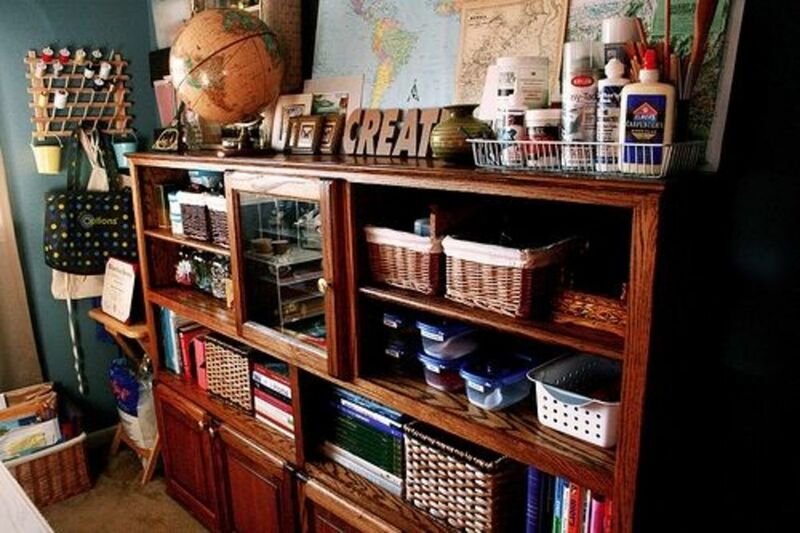 use various types of organizers with shelving and cubbies to keep the organizers nice and tidy. 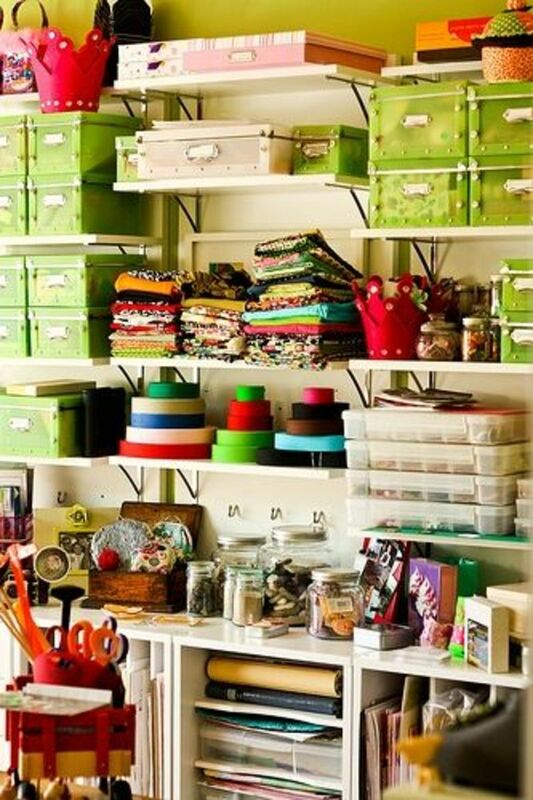 Design your craft room with the ability to expand if need be. Using simple bookshelves, cubbies and dividers that are interchangeable, stack-able and join together, will allow you to add or take away space as needed. 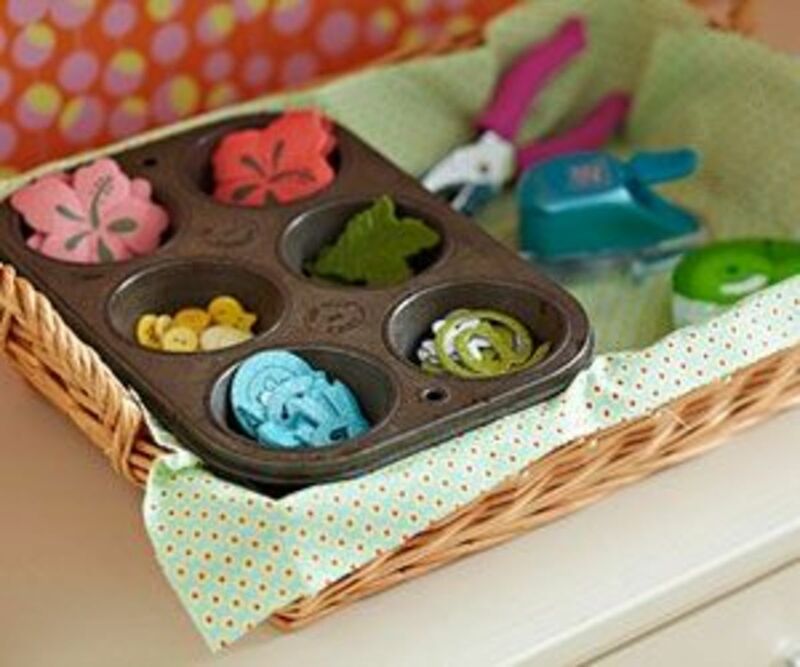 Mix it up a little to allow for various types of craft supplies. Use simple totes that can be found at Walmart, the dollar store, Micheals and online to sort and organize craft supplies. Don't think that every thing you use has to be labeled 'craft organizer'. Find ways to re-purpose totes, shoe boxes and other types of containers. Dowels can be used as a ribbon dispenser along with sorting, hanging and making it easier to catalog through various types of ribbons, trims, ropes and other type of 'string' materials. 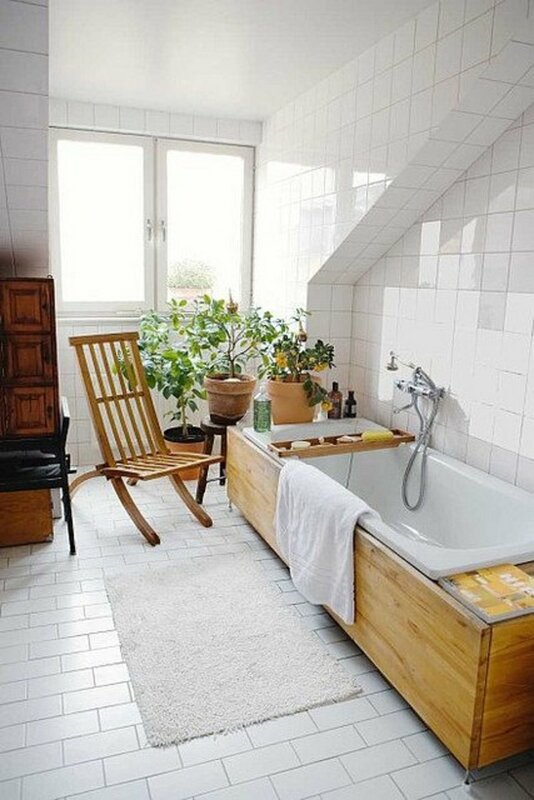 Going back to reusing old furniture, let your creativity take hold and get creative! 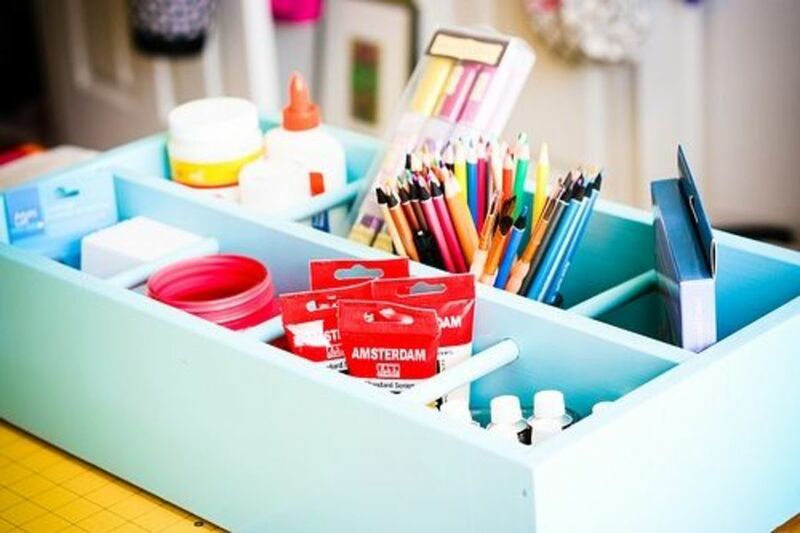 Use your imagination to coordinate your re-purposed piece of furniture into an organizer that is not only functional but adds design, texture, color and visual appeal to your craft room. 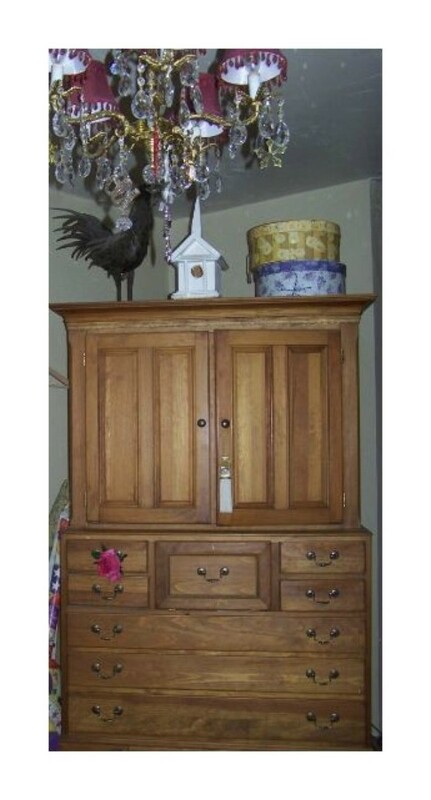 Before throwing out a piece of furniture consider reusing it in your craft room. The more space you have with shelves, cubbies and dividers, the more organized you can be. If the color of the furniture doesn't match your current materials consider painting it, reupholstering it, or maybe even some decoupage. How Big is Your Craft Room? Huge, More like a craft studio! Average size...not too big but not too small. Small, wish I had more space. What craft room? Still working on creating the right space! 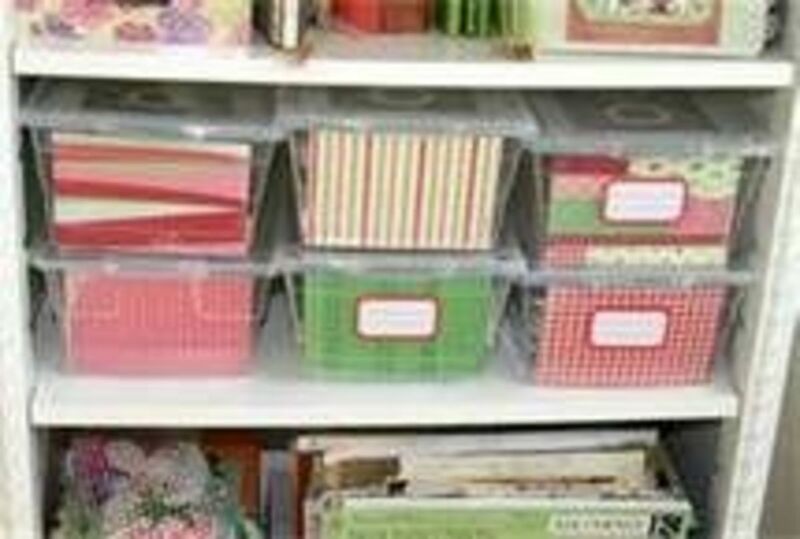 Using dividers like the ones in these pictures are a great way to organize your craft room without spending a fortune. These types of dividers can usually be found online for less than $50 a piece. 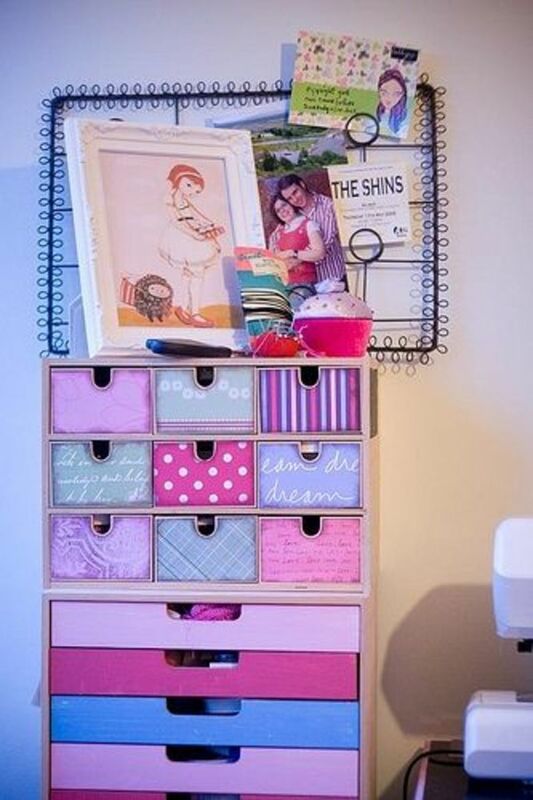 You can stack or join them side-by-side to create a tidy storage area for your crafts. They are especially great for organizing scrapbook materials. Lightweight for stacking on top of other storage boxes. Painting supplies such as brushes, sponges, markers and pastels can be divided among caddies so that they are all together for convenience but still nicely separated. Caddies can be used for other types of crafts that require a specific group of items. 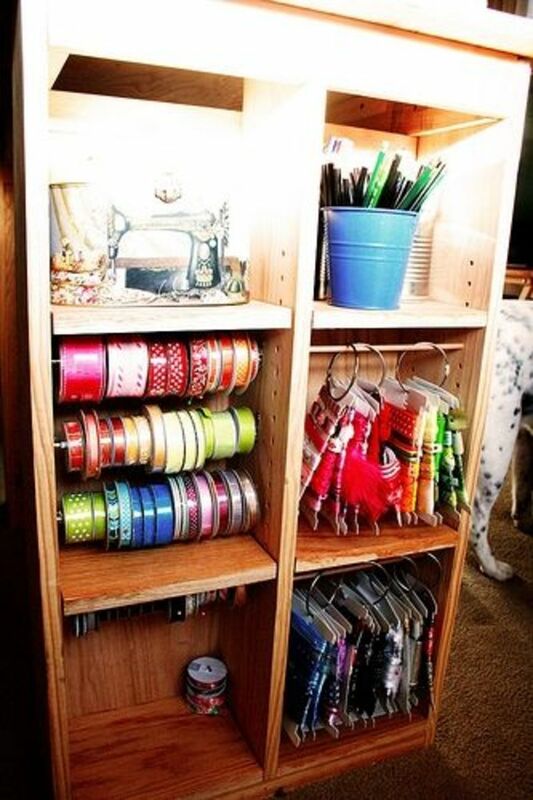 Cubbies are a great way to organize skeins of yarn, fabric and other bulk items. 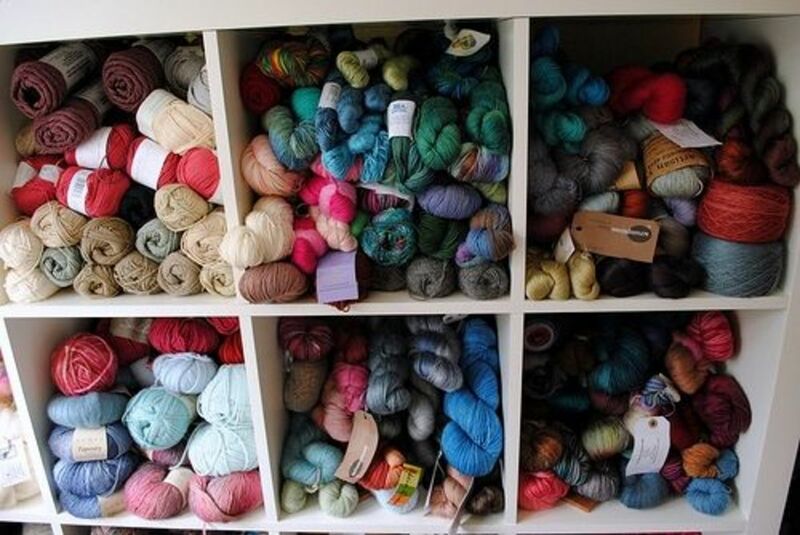 This specific photo shows you how easy it would be to organize hundreds of skeins of yarn. 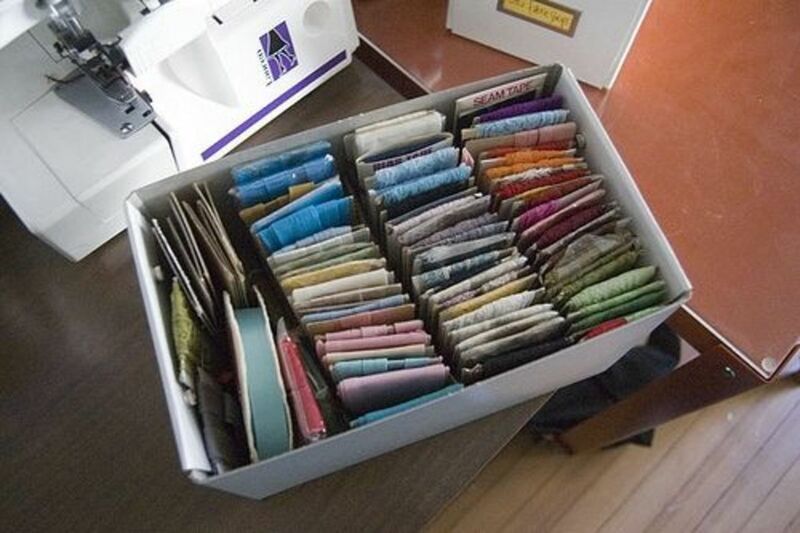 Folded fabric, tulle and other bulk supplies could also be organized the same way. You can usually find cubbies for around $25 with 2 to 3 compartments that stack with each other to create an organizer to fit your needs. When it comes to designing your craft room layout the first thing to consider is space. If you have small areas you will want to utilize wall space to free up more floor space for work areas. Small spaces can benefit from using pegboards, wall shelves, and stackable shelves. Place your table near a bright window to help light the area without desk lamps to take up more space when possible. Leaving the floor area open and putting the table against the wall will allow the tight-spaced area to feel more open. Utilize closets in the room for more storage area to keep the room more open. Larger craft rooms will have more versatility. Larger craft room layouts benefit from having a center workstation much like an island. These types of work stations can be as simple as a nice table or elaborate with a full studio style work table that has organizers built in. Check out Craft Room Furniture for some of the best options for craft room layouts, organization and work space ideas. Once again, you see the value of the cubbies. This one is also organizing yarn along with craft books. 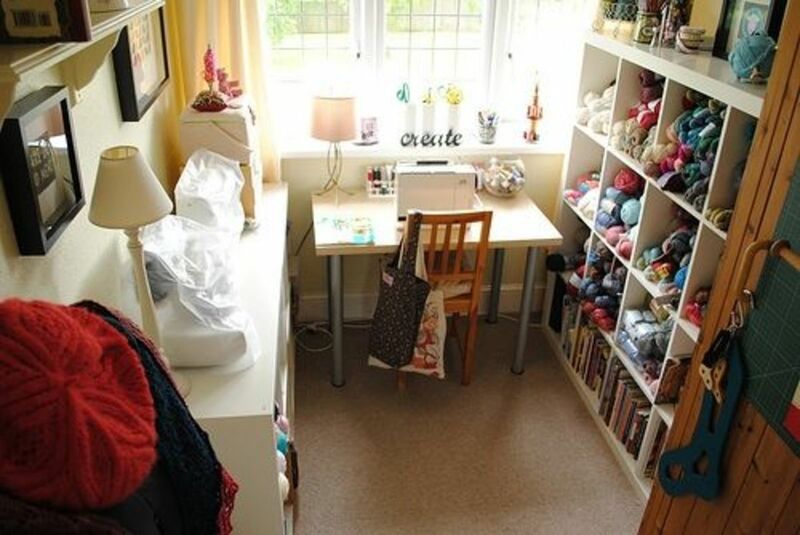 This is a relatively small space that has a work table with plenty of shelving on the right side along with a smaller set of shelves on the left side that also serves as a work station and storage area for multiple sewing machines. It has a nice, bright window for natural light and even has simple décor and photos to add a touch of cozy design. Consists of 15 smaller cubbies. Perfect for smaller baskets, shoe boxes and organizers. While we all dream of a professional craft 'studio' for our craft 'room' sometimes we have to compromise. This simple layout is tidy, functional and other than the metal shelves, very inexpensive. The baskets, totes, and other organizers can be found online, at the dollar store and local box stores for only a few dollars a piece. While they may not all match perfectly or create a specific theme, they still serve a purpose- organizing your craft supplies. Mason jars, baby food jars and jars of various shapes and sizes work great for organizing pins, buttons, stones and other embellishments. When separated out into colors they work great for adding color, style and creativity to your craft room design. Plus they are cheap! Do Your Decorate Your Craft Room? Yes, it is designed with a specific theme/pattern/style. Decorated? I use my design skills on the crafts...not the craft room. No, but I would like it to be! "Shoe Boxes' which are typically a normal box with a lid around the same size as a shoe box. If you are on a budget and can't afford the stylish shoe boxes you would purchase from a craft store you can always use regular shoe boxes that come with your shoes. The great thing about shoe boxes is that they stack easily, can be labeled with basic labels and are perfect for larger craft items, photos, punch out and other craft supplies that don't fit into small caddies or organizers. Set of 12 durable-plastic shoe boxes that stack into snug towers. Clear boxes with white lids make labeling and storing a breeze. 5 assorted plastic organizer boxes with lids and labels. Too cute! One of the most annoying thing to deal with in the crafting world is locating the perfect thread just to have to scramble around and untie a not of loose ends. There is no need to get up to find the color you need, dig through drawers to find the perfect match or fight with loose ends. 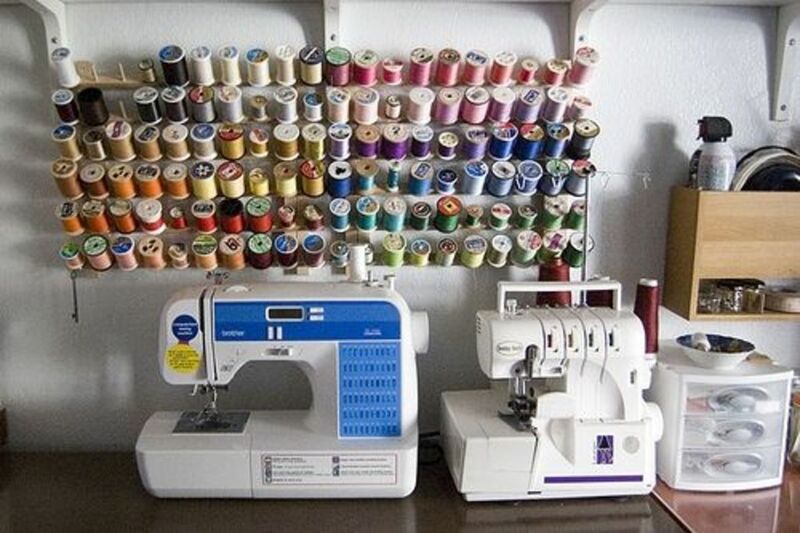 Thread racks and even bobbin racks are a must have for any craft room that has a sewing machine! Holds 120 spools of thread. 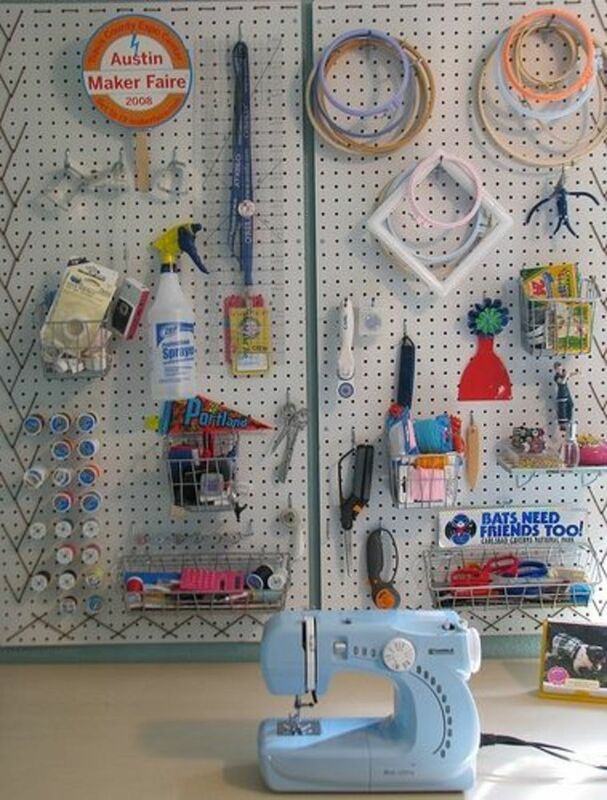 Pegboards are a wonderful way to organize craft tools such as scissors, hoops, shears, measuring tapes, frames and other hand tools. You can also purchase baskets and small shelves that connect to them for more organization. Clear pegboard with 70 hooks, accessories and scrapbook supply organizers. You can also purchase extra accessories to add to it as needed. If you don't have space to create a dedicated craft room consider using a pantry or closet to organize and store your craft supplies. Simply take what you need to your work space, which can be the kitchen table for that matter, and return your leftovers. This is a great idea for spare bedrooms that you want to keep tidy. 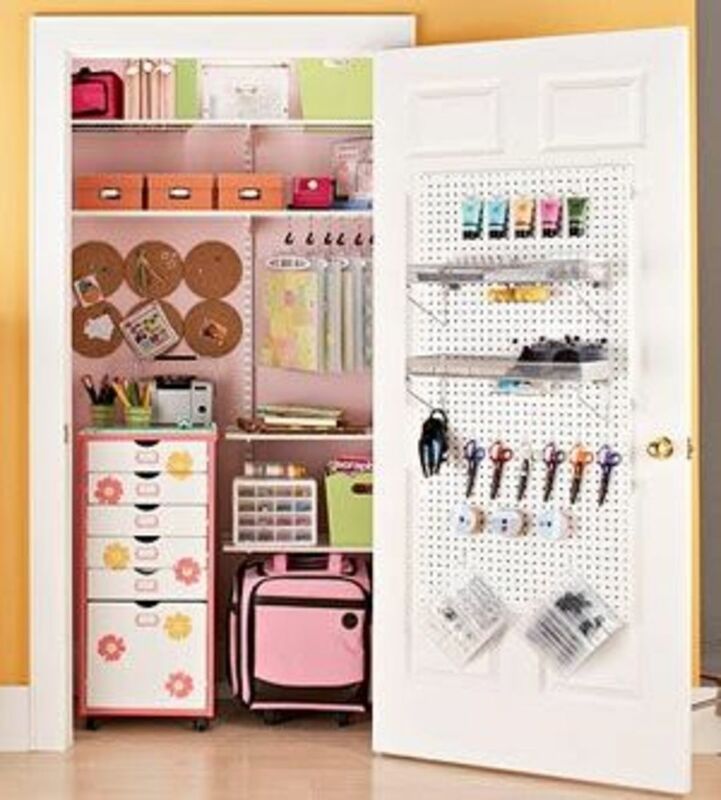 Notice the pegboard on the door to create a quick and easy go to place for hand tools. This chic craft cart is perfect for storing, organizing and easy transporting of craft supplies. 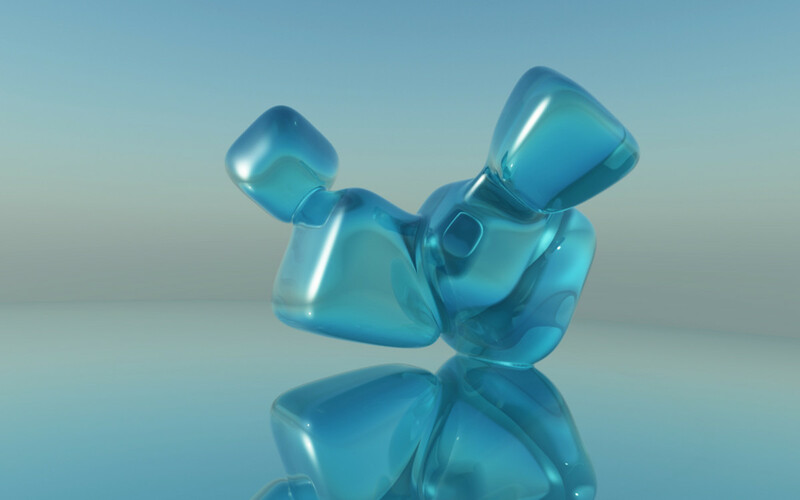 Move it from your work station to it's home location or a closet quickly and easily. You can find wine racks nearly anywhere including garage sales. 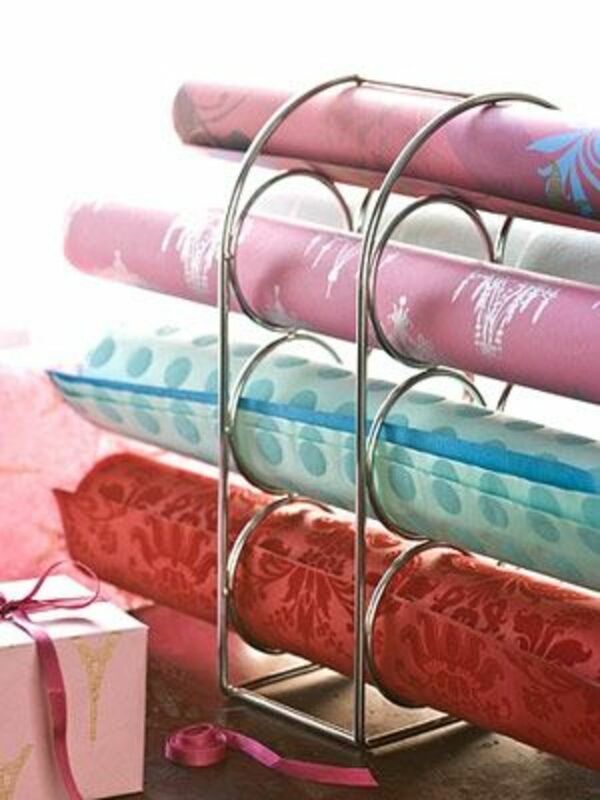 They make a great organizer for wrapping papers, rolled papers, fabric rolled up and other cylinder shaped supplies. Reuse Every Day Items - Don't Toss It Out! Recycle It in Your Craft Room! Consider recycling older objects that have dividers, lids, compartments or other spaces that could be used to organize your craft room. Super Organized! Every tiny bead has it's own place! Organized but could be better. Needs to be organized but it's manageable. Turn a craft hutch into a clever craft supply organizer that is already fully equipped with everything you need to organize and store nearly every type of craft supply you can think of. 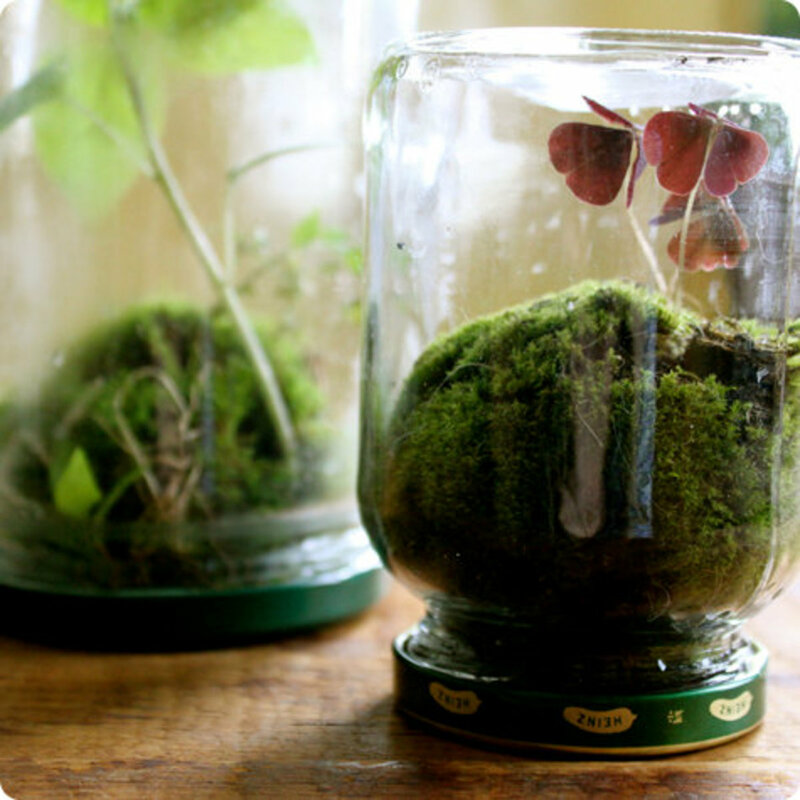 These are great for small areas, tight spaces or those who don't have the space for a conventional craft room design. Turn even the smallest areas into a craft room suite by simply opening two doors and pulling out the table. This hutch includes dozens upon dozens of storage containers, shelves, dividers and various other craft organizers. Simply slide the table in and close the doors and viola! You have a clean office, living room or dining room that is perfectly tidy that no one will ever know was a craft studio 5 minutes ago! 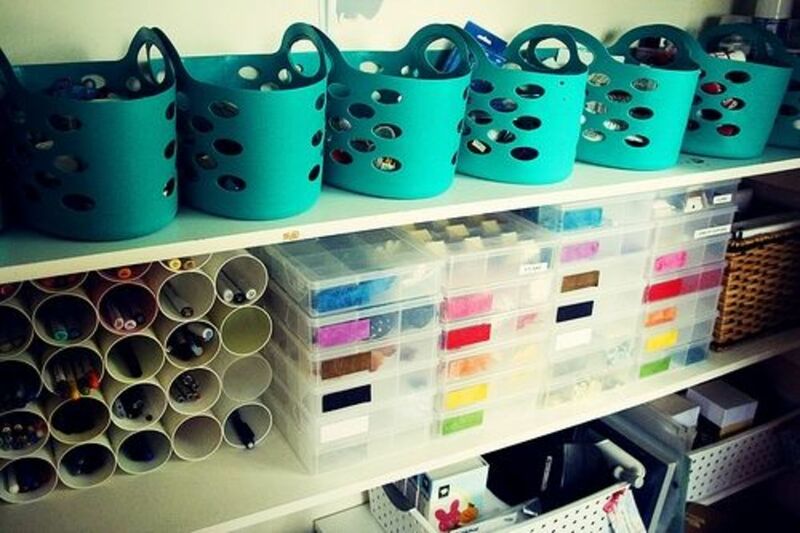 Share your tips and ideas for organizing and designing a craft room. What are Your Thoughts, Suggestions and Tips for Designing a Craft Room? 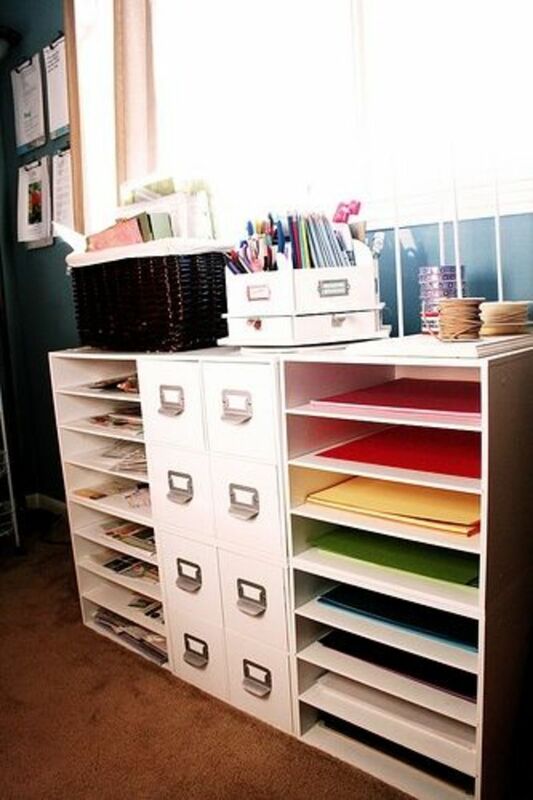 Great ideas for organization! Thank you for the inspiration! It was so fun to see all the photos here. What great ideas. I'd probably have more fun organizing than the crafting itself! Great lens! Hi, it's me, Squidoo's Creative Crocheter Contributor, dropping in to give your awesome lens a little lens rank boost! Have a great day, and be sure to watch for my next article in SoCrafty Magazine... because you might just be in it! A lens after my own heart! This is a wonderful lens. Great ideas. Thank you! So many great ideas ~ so little time. LOL Thank you for such a well done presentation of ideas illustrated with excellent pictures. Blessed! I've seren the scrapbook workbox before and this was a good reminder of that being a massive space saver if you have a small space. Keeping that back in my mind for our next house (going smaller!) Thanks for the info/reminder! excellent! 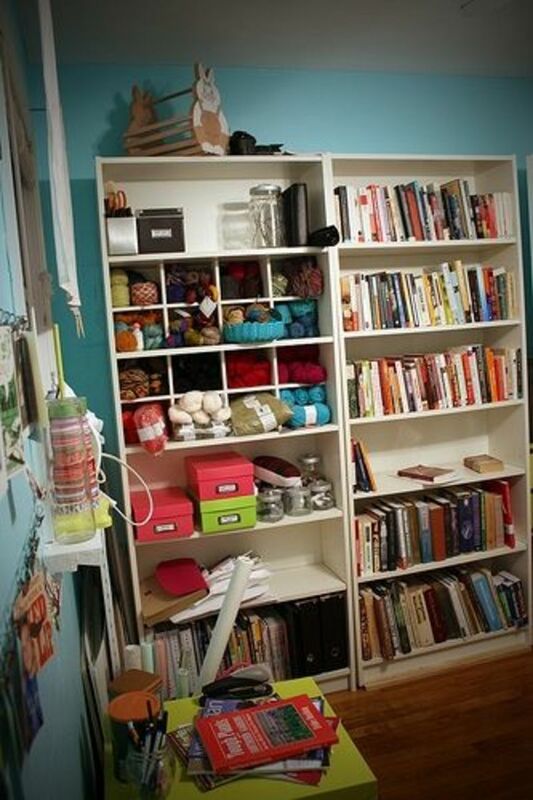 I have a picture of how I want my craft room to look like using the cubby or cube storage. I have a small start on it. My craft room is a total disaster area right now! It should be bright and have plenty of storage room with a large table. Great ideas. I just have one table at the moment and a disorganized closet. I love the idea of the hutch - especially good for when you have a small child (as long as it locks!). Great lens! I think it will be very helpful - if I will have a craft room one day, I will use your ideas! I love this lens! All my crafts are stuffed in different closets all over the house. The one closet I use the most has sliding doors which cause me much disdain!I use many of my craft tools for more than one type of project which also causes confusion about where to keep them. Someday I will get organized! Excellent lens! We plan on featuring it on the So Crafty homepage Thursday (June 21)! love the pictures...and the lens of course...i don't have a craft room but hopefully when i got my own place...craft room, writing room, library...anything that could have that solitude for your work.